A country estate in Ireland in 1880s. 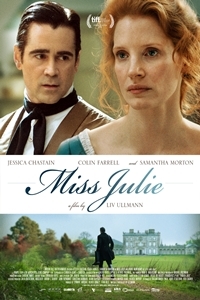 Over the course of one midsummer night, in an atmosphere of wild revelry and loosened social constraints, Miss Julie and John, her father's valet, dance and drink, charm and manipulate each other. She, all hauteur longing for abasement; he, polished but coarse - both united in mutual loathing and attraction. By turns seductive and bullying, savage and tender, their intimacy leads to desperate plans and vision of a life together... Unsure if the morning brings hope or hopelessness, Julie and John find their escape in a final act as sublime and horrific as anything in Greek tragedy.